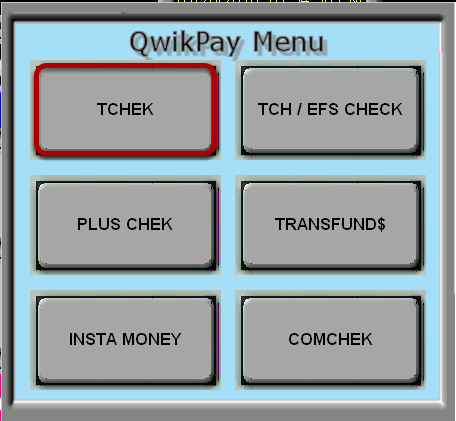 TravStar1 Point Of Sale SystemRegister Manual Fleet ChecksHow Do I Process a TChek Check? How Do I Process a TChek Check? 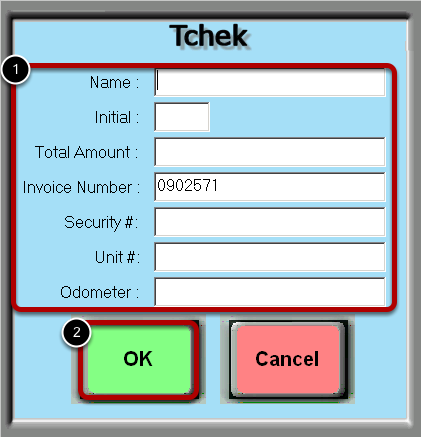 A Tchek check is a physical check issued by Tchek. A printed paper check may be presented by the customer or a blank check will be given to the customer to fill out. Touch the "Plus Check" button. A printed paper check may be presented by the customer or a blank check can be given to the customer to fill out if they have an express code. The Express Code is a secure series of numbers (16 or 24 digits in length) that designate a specific dollar amount when created. Save the paper check to keep with daily paperwork. Prev: How Do I Process a Fleet Check? Next: How Do I Process TCH / EFS Check?